The point is, it’s possible! 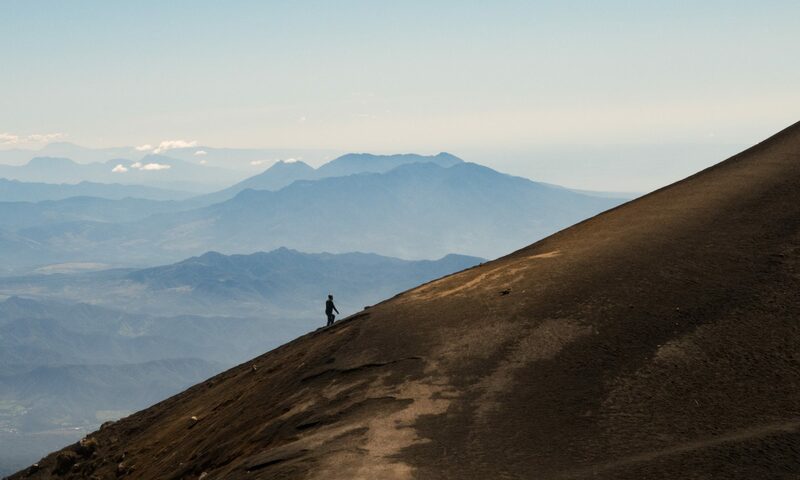 And half the “fun” and challenge of a trip like this is figuring out how to make it all work. 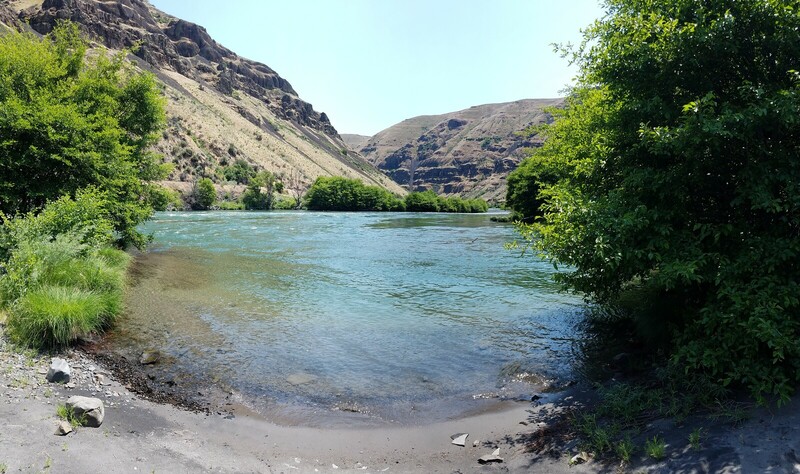 Earlier this week I headed down to the Lower Deschutes for a final shakedown cruise. My goal was to use every single piece of gear in my kit at least once, all during the same trip, to make sure everything worked as intended. Although there were a few glitches, overall things went very well! 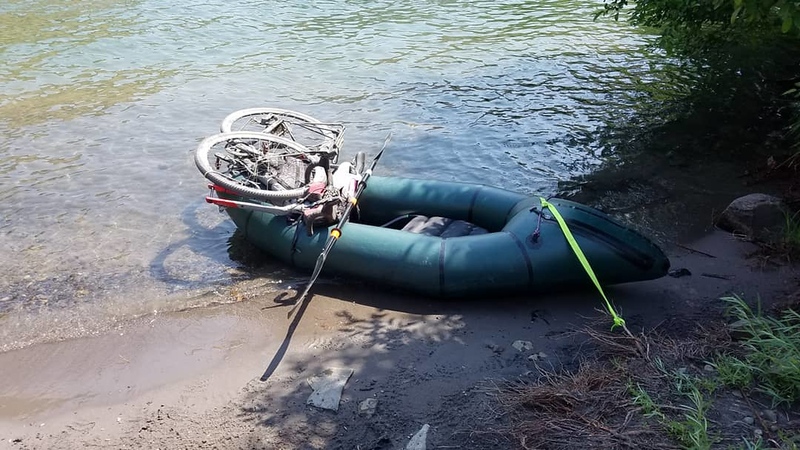 Alpacka Rafts has generously provided me with their new bikerafting-specific Caribou, which I roll up and lash to the rear rack. On top of that is a drybag full of clothes plus my food and stove in a bearproof food bag. The panniers are ultra-lightweight and waterproof, and just big enough for my Hyperlite Ultamid 2 tent as well as my river shoes. In my Revelate Designs frame bag, I carry my 10 essentials, my bike maintenance and repair kit, my raft repair kit, and toiletries. I’ll have 3 water bottle cages – 2 on my forks, and one underneath my bottom bracket. 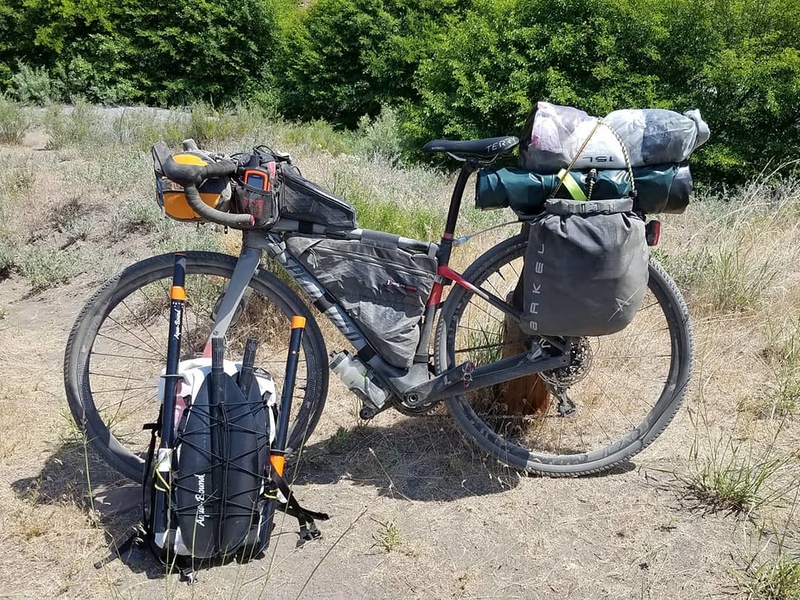 My sleeping bag and down jacket are stuffed in an ultralight, compressible dry bag and lashed to my handlebars with bungees. Revelate Designs mountain feedbags and a Gas Can hold most of the things I’ll need to access throughout the day – satellite messenger, sunscreen, snacks, phone, chapstick, etc. Finally, on my back is a Hyperlite Mountain Gear Summit Pack with my PFD inside and my paddle lashed to the outside. 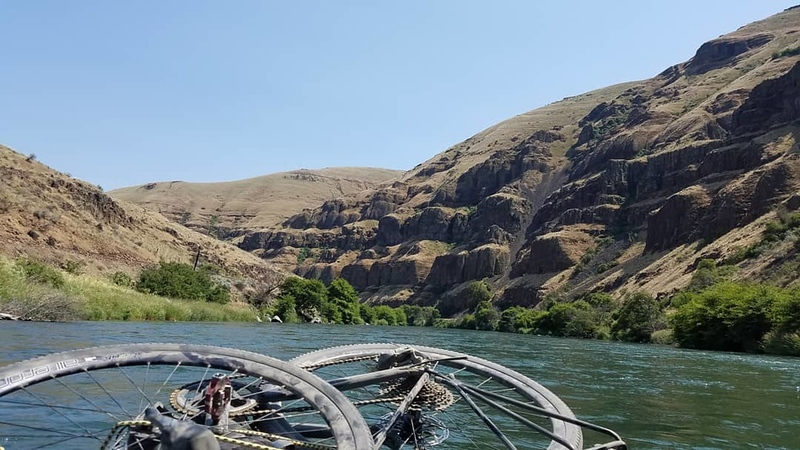 Once I arrive at the put-in, I start breaking down my bike and getting ready to paddle. 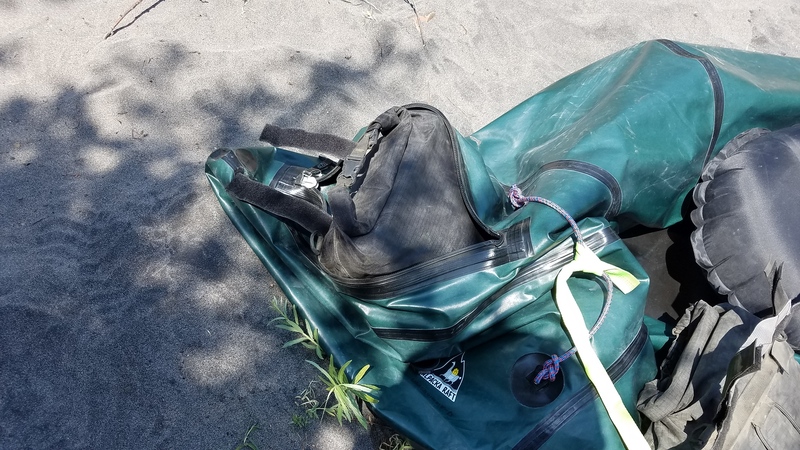 One very cool feature of the Caribou is that it has a cargo fly, which is essentially a giant waterproof zipper that allows me to stuff all my gear into the tubes of the boat. Of course, once my gear is in the tubes I can’t access it without deflating the boat. 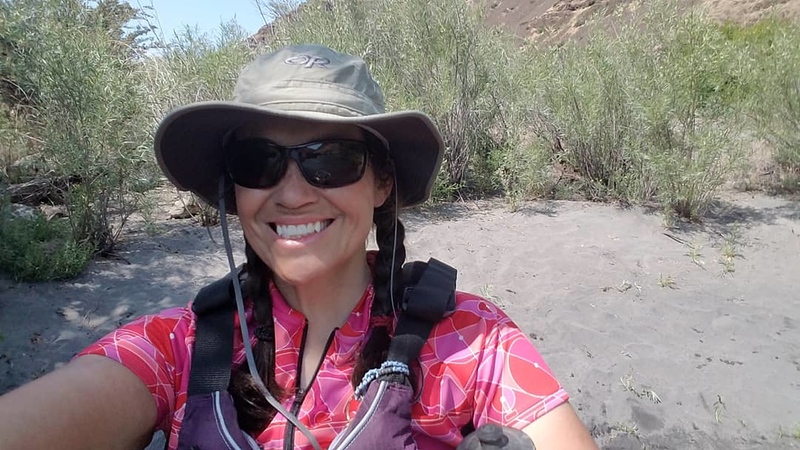 Therefore I use my Summit Pack (the same one that carries my PFD and paddle while I ride) to carry misc stuff that I might need throughout the day while paddling (sunscreen, snacks, satellite messenger, etc). Last but not least I remove the front wheel from my bike, and lash the frame and wheel to the bow of the boat using bungees. And voila, it’s time to paddle! 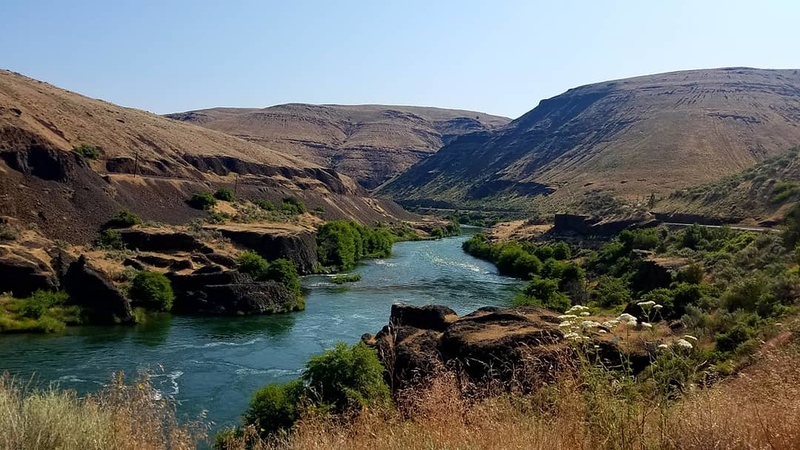 The lower Deschutes is a lovely section of turquoise water, sprinkled with Class 1-2 riffles and flanked by gorgeous canyons. I only ran a short segment from Oakbrook to Beaver Tail and would love to go back for a longer trip sometime soon. But first, Alaska!